Eight trends to follow in 2013 and beyond. Rather than attempt to predict the unpredictable – that is, specific events and price levels – let’s look instead for key dynamics that will play out over the next two to three years. Though the specific timelines of crises are inherently unpredictable, it is still useful to understand the eventual consequences of influential trends. In other words: policies that appear to have been successful for the past four years may continue to appear successful for a year or two longer. But that very success comes at a steep, and as yet unpaid, price in suppressed systemic risk, cost, and consequence. Intervention in the stock market may successfully keep the markets in an uptrend or a narrow trading range for 2013, but this would only increase the odds of a dislocation/crash in 2014 or 2015. Temporary success does not imply permanent success or even continued success of intervention. Why is this so? Virtually all Central Planning intervention—fiscal and monetary stimulus, subsidies and market manipulations—suppresses market pricing of risk and volatility. In a healthy, transparent market, millions of participants openly price risk, volatility, assets, and capital. This creates low-intensity volatility and resilience. When transparent markets reprice risk, assets, and capital in a panic, the recovery is equally dramatic as participants quickly adjust to the repricing. Confidence is based on transparent pricing by participants, not officially sanctioned manipulation. The purpose of Central Planning intervention is perception management. Central Planners want to restore confidence; not with transparent repricing, which would hurt holders of assets and banks, but by engineering a steady rise in asset prices and reversing any declines with indirect buying. This instills confidence via participants’ "Don't fight the Fed" belief that Central Planners will never let the market go down. History rather unkindly finds that Central Planning elevation of markets and suppression of risk is impermanent: Intervention leads to crashes. Why is this so? Risk cannot be eliminated; it can only be transferred or suppressed. When it is suppressed, it eventually bursts out. The greater the suppression, the greater the eventual dislocation. There are various analogies for this; for instance, the stick-slip hypothesis of seismic faults and earthquakes. While the surface appears stable, pressure invisibly builds far below and is eventually released in an earthquake. In our financial example, sudden repricing of risk and assets is the equivalent of an earthquake. Many commentators have observed that the positive effects of the Federal Reserve’s Quantitative Easing programs are diminishing both in duration and market pricing. The market soared for months on end after QE1, but the rally quickly fizzled after QE4. This reveals the decay factor in intervention: Each intervention must be larger as its efficacy decays. The policy consequence of this decay is that Central Planners must “double down” their bets to keep the perception-management “recovery” and market on track. As I explained in my book,Why Things Are Falling Apart and What We Can Do About It, the analogy is a gambler who is using borrowed money to make ever-larger bets in a casino. His first few bets are wins, prompting confidence in his skills and in his lenders. Eventually the gambler loses his entire stake in one enormous bet, and the loss is so monumental that it brings down the casino and his lenders. The markets’ ability to transparently price risk, capital, and assets has been fatally compromised. A systemic increase in brittleness and fragility is the inevitable result when low-intensity volatility and risk are both suppressed by constant intervention. The widening credibility gap between official pronouncements of recovery and less manipulated metrics also forces Central Planners to double down on their interventions. This is evident globally, as Europe, Japan, and China are all doubling down on interventions that are yielding increasingly marginal returns. Though the Fed is nominally independent, like every other arm of Central Planning, it swims in a political sea. The initial success of QE1, 2, and 3 and ZIRP (zero-interest rate policy) boosted the political capital of the Fed. Faith in the implied omnipotence of “Don’t fight the Fed” has been rewarded for four years. The failure of its policies to engineer a durable recovery will erode that faith and the Fed’s political capital, restraining its freedom of movement. We can already discern rising doubt in infinite QE and permanent ZIRP in the Fed’s minutes. Outside the Fed, what can only be characterized as distain of the Fed and its destructive policies is increasingly visible. The decay factor of its monetary-stimulus policies and the decline of its political capital will increasingly render the Fed impotent. By 2015 we may well be dumbstruck that everyone once hung on the Fed’s every word as if the Fed resided on Mount Olympus. The credibility gap between MSM stories of recovery—higher GDP, auto and home sales, lower unemployment rate, etc.—and what is visible on the ground will widen, eroding MSM credibility. With the Internet providing distribution of alternative metrics, Central Planning and the Mainstream Media will increasingly be revealed as propaganda organs rather than servants of the citizenry. Now that all Keynesian policies have been pushed to the maximum, there is essentially nothing left to deploy. This chart of money velocity reflects the endgame of Keynesian stimulus. Money is being printed and dumped into the financial system in size, yet the velocity of that money is trending toward zero. The social consequences of economic stagnation will attract more attention. Japan is the lab experiment for what happens to a nation’s youth when opportunity declines and many young people are unable to earn enough money to buy homes and support families. They withdraw into a state of permanent adolescence, living at home, staying in college for extended periods, delaying marriage and children, working part time, surrendering long-term goals, and in some cases indulging in a lifestyle centered around video-gaming and pop-culture hobbies. Consequences of Permanent Adolescence include lower birth and marriage rates, depressed rates of household formation, lower auto and home sales, declining tax receipts, and what might be called “social depression,” as expectations and goals stagnate along with opportunity. 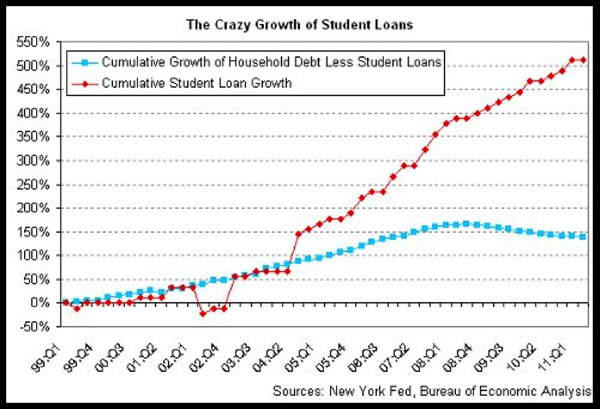 Soaring student debt has turned the current generation of university students into debt serfs. This will continue as alternatives to a conventional college education remain on the margins. 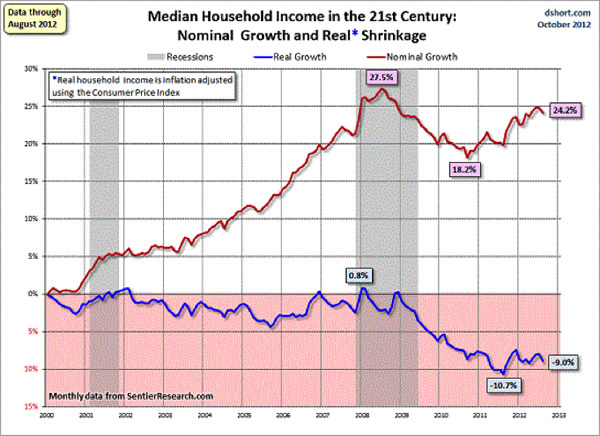 Income will continue declining in real terms. Nominally, income appears to have grown 24% since 2000. Adjusted for inflation, it has declined by almost 10%. 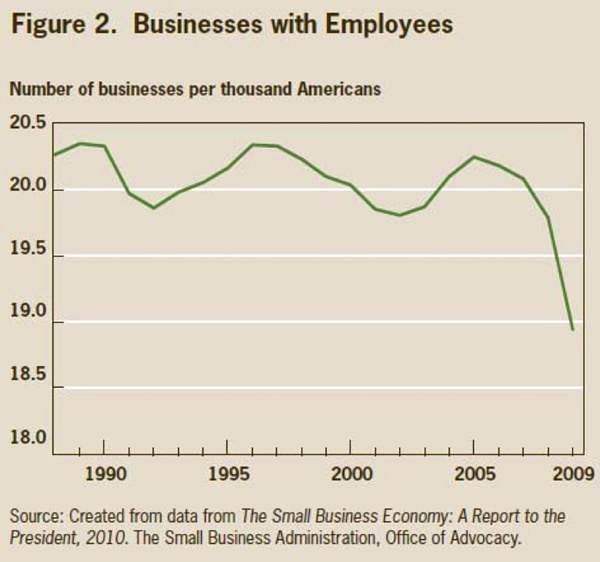 Uncertainty, globalization, recession, and higher taxes and regulatory fees have eroded the incentives to risk capital and time in starting or expanding a small business. The Senkaku Islands are one such flashpoint where compromise appears impossible since the domestic populations of Japan and China have been persuaded by nationalistic hyperbole that a "line in the sand" has been drawn. It is already abundantly clear that trade will be trumped by domestic politics in territorial conflicts. This creates the potential for serious economic dislocations in global trade and capital flows. Earthquakes are notoriously difficult to predict. So are market dislocations. Risk is inevitably mispriced when unprecedented intervention suppresses risk. In Part II: Understanding the Outcomes that Will Matter Most, we look at eight fundamentally disruptive developments that will manifest from the one dynamic that really counts: the powerlessness of the Status Quo to reverse the eight trends discussed above. The only thing maintaining the Status Quo is faith in its stability. What will happen when that confidence breaks, as the math shows it must? New instrumental song (5:36) by CHS and Coconut Charlie: Alex and Daz Theme (the characters in I-State Lines -- one of My Novels). Thank you, Craig H. ($50), for your extraordinarily generous contribution to this site -- I am greatly honored by your steadfast support and readership. Thank you, Lawrence R ($10), for your much-appreciated generous contribution to this site --I am greatly honored by your support and readership.